Investigators are seeking the identity of a caller whose hijacking threat left a jetliner grounded and passengers wondering why two of their own were escorted off the aircraft by authorities. Police said that a clerk at a business in Alameda, a city across San Francisco Bay from the airport, reported receiving a threat specifically directed at the American Airlines flight. The clerk called police shortly after 9 a.m. Thursday and said the business had received an anonymous phone call, Lt. Bill Scott said. 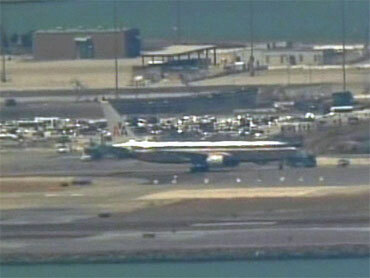 About an hour later, American Airlines Flight 24 pushed off from the gate long past its scheduled 7:30 a.m. departure. Within minutes, the New York-bound plane was diverted to a remote section of the tarmac at San Francisco International Airport, where it sat for several hours before it was searched and two passengers removed for extra scrutiny. Other passengers were taken by buses to a terminal for further security checks. The plane was carrying 163 passengers and 11 crew members. The FBI later determined that the telephoned threat wasn't credible, but the incident still rattled nerves as it played out live on national TV. Although passengers described the scene aboard the Boeing 767 headed to John F. Kennedy International Airport as calm, witnesses said a man and a woman sitting in the back row were taken off in handcuffs. But they were quickly released and allowed to rebook their flights. The couple confirmed to an Associated Press reporter that they were the ones who had been removed from the plane but declined to identify themselves. They said authorities explained they were picked at random for questioning. But a fellow passenger suggested the couple may have been targeted because of their appearance. Michael Anderson, 20, saw the couple at the American Airlines ticket counter after all the passengers were let off the detained plane and observed them carrying passports from Pakistan. "It definitely seems like it was racial profiling, based on what they look like physically and the fact they are Pakistani. It seems like this was a false accusation," said Anderson, a Yale University sophomore who was heading back to school. Passengers on the flight who had Internet access searched the Web for details about the incident. They were allowed to go to the restroom one at a time, with flight attendants admonishing anyone who tried to get to their overhead luggage, said Michael Kidd, 48, of Folsom, who missed his connecting flight to Barcelona because of the delay. Police eventually entered through the back door and escorted the two passengers into a police car. Others on board were taken off the plane six at a time and greeted by San Francisco Police Department officers who used security wands to screen them and their carry-on luggage. They were then taken by buses to a terminal for further security checks and to rebook their flights. "The two passengers were taken off the plane separately, but we cannot discuss the specifics why," said FBI spokesman Joseph Schadler. The couple declined to discuss the possibility that they may have been targeted because of their appearance but said they were treated well and only questioned briefly before they were allowed to go to the ticket counter like all the other passengers. Kidd said he and his wife did not believe the couple had been racially profiled based on appearances alone. The man wore a Los Angeles Lakers jersey and the woman was wearing a beret, and they looked like typical Californians, he said. Schadler said officials acted quickly and the Transportation Security Administration ordered the plane away from the main terminal. "We take any threat against an airline or potential terrorist activity very seriously," he said. "You treat them like it's real until proven otherwise because the cost of failure is so high."